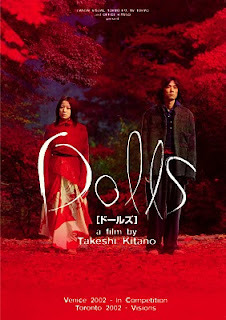 Dolls is a film about colors. There is a story there. A very good and touching story too, about life and love and the strings that bind two people together. But that all takes second place to the colorful landscape in which these characters travel. This is another masterpiece, from a long line of masterpieces, by Japanese master Takeshi Kitano. It stands out from his other films however, in that it has no violence. But, in tone with the rest of his filmography, it is a very quiet film. Also, as with all Kitano films, the soundtrack by Joe Hisaishi is as beautiful as can be.